Faster and more intuitive, with some great new features! Light Blue 6 sees our biggest facelift for three years! The new design looks much more at home in the latest versions of Mac OS X and Windows, but we’ve done much more than give it a superficial lick of paint. One of the key things we’ve done is make it much clearer where you are in Light Blue, where the information you’re looking at came from, and how to get around. You can now see very clearly which section is selected, then the quick queries it contains, and which records the selected query contains. This makes it really clear which subset of records you’re working with, and makes it much more obvious that the quick queries list is there to help you find the information you’re looking for. New typography in the list of records makes it much clearer and easier to read – especially helpful when you’re working with the large amounts of data that you can build up when you’ve been using Light Blue to run a busy photography business for several years. It’s not just the biggest, most obvious parts of Light Blue that we’ve been smartening up: we’ve systematically gone through the whole program and made things easier to understand and use, as well as working out better ways of presenting the important information you’ve been entering into Light Blue. We’ve improved lots of the plumbing and wiring that does so much hard work behind the scenes, all of which helps to make Light Blue 6 faster and easier to use. For people taking a new trial, we’ve completely reworked the sample data that’s set up when running Light Blue for the first time. This helps newcomers get up and running faster, without having to worry about much of the setup side of things. Our optional online services offer so much more than just syncing your data between computers! In Light Blue 5.5 we added an online contract signing service that saves time for photographers and is really convenient for your clients. Light Blue 6 adds two great new features that make it really simple for you to get the information you need from your clients, and to help them to pay you promptly. Light Blue 6 makes it easy to ask your clients for information via our new online forms. You can use our new forms as a contact form, but you can also create forms that gather all of the information you need from your clients when they confirm a booking with you. 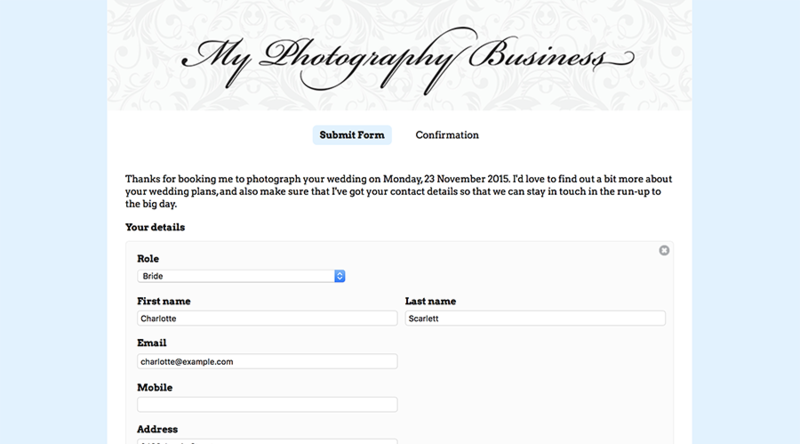 These forms can be included as part of an online contract, or you can simply add a standalone form to a shoot and send it to your client. When your clients submit a form to you, it’s easy for you to update Light Blue without typing everything in yourself. Light Blue’s online forms are also designed to be really convenient for your clients to use. Any information that you already have about your clients or the shoot, such as the clients’ names and contact details, is already included in the form – it means that your client can simply confirm that what you already know is correct and fill in any missing details. You can also use Light Blue’s online forms like a contact form: new clients can fill in the details of their enquiry, and it will appear in Light Blue’s Inbox. We’ve also made it easy to embed our contact forms into your own webiste, so your client doesn’t have to leave your site to use them. Our online contract signing service already lets your clients pay a booking fee online, and that’s been really popular with both photographers and their clients because it’s so much easier than dealing with cheques or bank transfers. In Light Blue 6, you can now publish any invoice to Light Blue’s client portal. Your client can then view the invoice online, and can pay you via credit card, debit card, or Paypal. It’s really simple! It’s now easier than ever to stay in touch with your clients, or make sure that they turn up for their appointments because you can send text messages directly from within Light Blue 6. Text messages can be sent to individual clients, but we’ve also created tools that make it easy to send messages to a selection of clients, or send out event reminders. Your clients’ replies go straight to your mobile phone, and our customisable templates make it easy to set up personalised messages using our mail-merge tags. Light Blue was originally designed for English-speaking photographers, but it’s used throughout the world. We’ve made it easier for photographers working in countries that speak other languages to use Light Blue by making it possible to translate our built-in templates, which means that you can print or create PDFs from Light Blue in your own language, using our built-in templates, instead of having to create mail-merge templates. Please note that Light Blue itself is still written in English. At present, we don’t have any plans to translate the whole application. Most photographers only ever need a single date and time for their shoots, but sometimes you’ll have more than one session (for example, if you’re photographing a multi-day wedding and want to show what’s happening on each day in your diary). In Light Blue 6, we’ve made it easier to keep track of what you’re doing in each session by letting you enter a description. These session descriptions are included in the ‘Current Events’ list on Light Blue’s Home screen, in the built-in calendar, and in all of our calendar publishing options. Appointments are a handy way of booking out time for meetings, viewing sessions, etc. We’ve made them more helpful in Light Blue 6 by adding a status field (so you can pencil in appointments to be confirmed later, or mark them as cancelled instead of deleting them), allowing you to add workflows directly to an appointment (so that, if the appointment is rescheduled, so are any linked tasks), and letting you log mileage claims directly against an appointment. 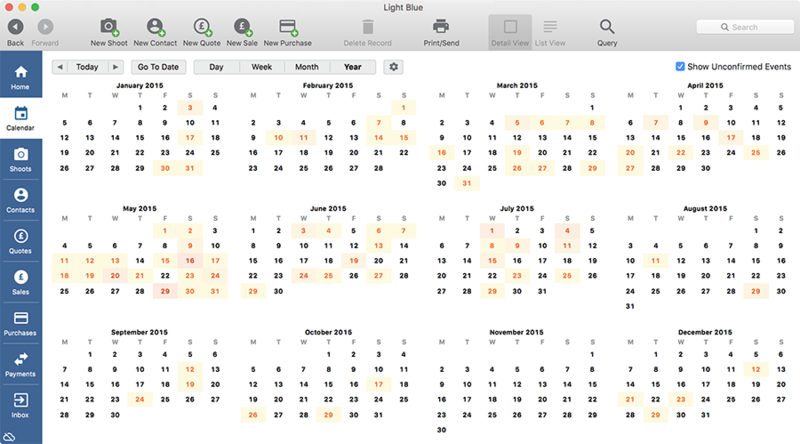 We’ve improved by Light Blue’s built-in calendar by adding a year view (which makes it easy to get an overview of your busiest times of the year, or to try to find a conveniently quiet time to book a holiday). You can also add notes to the calendar, which are really handy for setting up staff rotas, or making a note of important dates (such as your Christmas ordering deadline). We’ve always allowed you to add your own branding to our built-in invoice, quote and receipt templates but, up to now, you’ve had to use image files to do so. With Light Blue 6, you can now use a PDF letterhead template. PDF templates offer sharper text and logos, let you use hyperlinks in your invoices, and often produce smaller file sizes that are easier to email when you export a PDF from Light Blue. Accountants love spreadsheets, and we like keeping accountants happy. So, we’ve made it really easy to export all of the information your accountant is interested in out of Light Blue, by adding an ‘Export Financial Information’ command to the File menu. That single menu command will let you choose a period of time, such as ‘Last financial year’, then export all of your Sales, Purchases and Payments, and the items from those records, all in one go. We’ve also made it faster to enter details of sales you’ve made where you wouldn’t normally want to raise an invoice and send it to your client. For example, if someone pops into your studio to buy something then and there, or if you’re selling prints at an event. In the Records menu is a new ‘Quick sale’ command, where you can add some info about the person who’s bought from you, the price of the goods, and how they paid – it’s really quick to add all the information that’s needed. And, finally, also in the Records menu, you can now import Purchases from a spreadsheet, which is great for when you use a service like Receiptbank, or if you’ve got a load of historical purchases you want to add to Light Blue. We’ve changed the location that Light Blue stores its data in on Mac OS X. You can now find it in your Documents folder, inside a folder called ‘Light Blue Software’. This means it’s more visible, for example if you want to make a backup of it. The data folder is still in its old location on Windows. Our new redesign includes high resolution graphics for Retina Macs. The ‘Transactions’ section has been renamed to ‘Payments’, to make it easier to understand what it’s for. When using the Print dialog to attach a PDF to an email, you can now pick an email template instead of creating a blank email. When you’re importing data from the Inbox, you can now see whether any of the fields you’re important will overwrite existing information that you already have in Light Blue. The Activity panel on the main record screens now tells you when the record was created. In the query dialog, you can now query on a record’s created date. You can now query for records linked to shoot types, price lists, etc, that have had their ‘Hide’ checkbox set. When querying on a date field, you can now query for particular days of the week (e.g. “all shoots that happened on a Saturday”). When you print a shoot’s details, you can now include the contents of the shoot’s Activity panel. You can send emails directly from the Home screen by right-clicking on an event. We’ve added a contextual menu to the Task Manager. You can now email a document that’s already attached to a record’s Activity panel. Right-click on the document, or select the document and use the cog menu at the top of the Activity panel, to create an email with it as an attachment. We’ve created a ‘Housekeeping’ menu within the Records menu – our own bit of housekeeping! – and added a new option that makes it easy for you to tidy up Light Blue’s popup menus. It’ll make it really simple to track down and fix anything that you might have mistakenly typed into one of those fields. The login dialog now remembers the last member of staff to log in to Light Blue on that computer, and defaults the staff menu to that user. 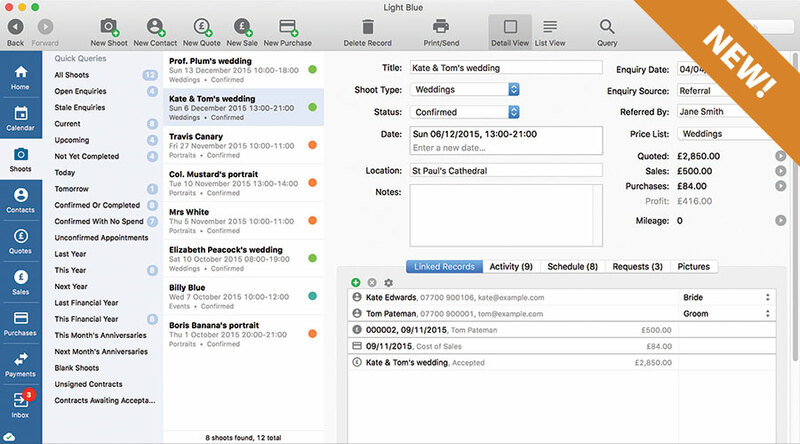 When you add a contract to a shoot, Light Blue automatically selects the wedding couple (for weddings) or the primary contact (for all other types of shoot) as signatories – it just cuts down on the clicking. We’ve swapped the ‘Publish’ and ‘Done’ buttons in the contract dialog to make it less likely that someone could click the ‘Done’ button to dismiss a contract, rather than sending it to their client. When you use the ‘Export’ command from the File menu to export shoot information, you can now choose to include contact information (e.g. email address or phone number) for your shoots’ primary contacts. The same goes for the List view. When you use the button in the Contacts detail panel to update a bride’s surname and set her maiden name, Light Blue automatically changes her title to “Mrs” if it’s currently set to “Miss”. In the Inbox, when you import something received from the Light Blue API or one of our new forms and you’re updating an existing record, it’s much easier to see which fields will be updated. We’ve added some new mail-merge tags: %ContactNextAppointmentStartDate%, %ContactNextAppointmentStartTime%, %ContactNextAppointmentEndTime% and %ContactNextAppointmentDescription%, %CurrentUserAddress%, and %ShootNextAnniversary%. Mail-merge date tags could already be turned into a ‘long’ date by adding “Text” to the end of the tag (e.g. %ShootStartDate% could be turned into a ‘long’ date by using %ShootDateText%). We’ve added a mid-length version that you can use by adding “TextShort” to the end of the tag (e.g. %ShootStartDateTextShort%). We’ve made it easier to charge mileage to a client by adding an command to Sale records’ cog menu that allows you to copy over the total mileage from that Sale’s linked Shoot. 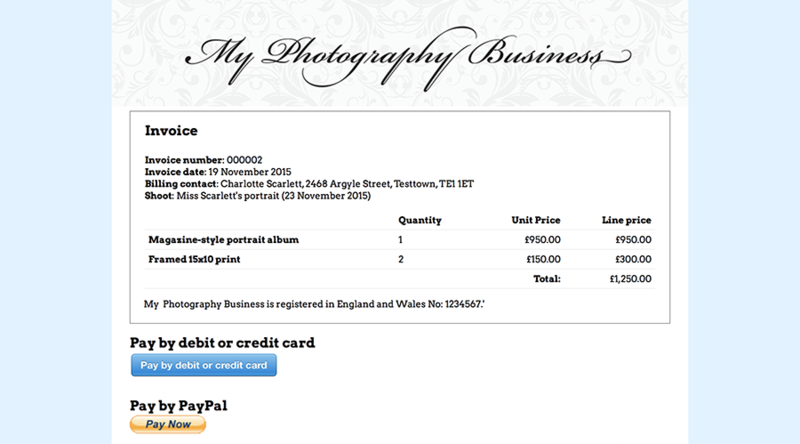 The Status field on Sale records is now hidden by default because it’s not used by many photographers. You can turn it back on in the ‘Custom Fields’ section of the Preferences window. From a Quote record, you can now create a Sale for two thirds of the balance (as well as the existing options for the full balance, half of the balance, or one third of the balance). On Mac OS X, you can use the Cmd-Shift-F keyboard shortcut to go to the Quick Search box. We’ve improved the way that addresses are formatted for Swiss clients.